As we save files on our storage device and after installing and uninstalling programs a certain amount of times, the files that are stored on our hard drive start to be fragmented, instead of being placed one next to the other, with the subsequent loss of reading and writing access speed on the hard drive. That is why it is necessary to defragment the hard drive every now and again, which simply consists placing the parts in contiguous positions on the memory, to make reading them a lot easier. 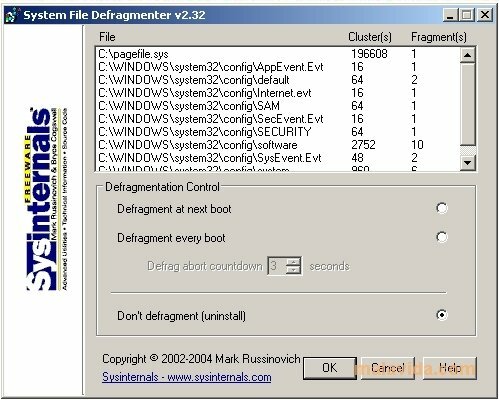 We can do this with some of the many programs that exist for this objective, like for example, the defragmentation application that is included per default in Windows, defrag.exe. But this isn't enough. 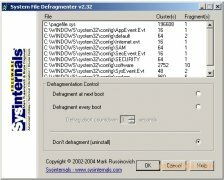 It is advisable to use an advanced program to defragment the paging file like for example PageDefrag, a software application that includes advanced techniques to defrag open files that have exclusive access. PageDefrag is very easy to use, you only have to decompress and launch it. After that, it will offer you the possibility to defragment the next time the system is launched, each time it is rebooted or uninstall the application.